← But What About My True Conservatism? So What’s Your Plan Then Mr. Non-Interventionist Smarty Pants? I am a long time veteran of the intra-conservative foreign policy debate. I like to say that I was a non-interventionist before Ron Paul made non-intervention cool starting with his Republican primary campaign in 2008. While I started out like most conservatives of my generation as a hawkish Cold Warrior, my perspective changed in the lead up to the First Gulf War, and I became an enthusiastic member of the Buchanan Brigades when Pat Buchanan challenged George Bush I in the 1992 GOP primary. On foreign policy I have not looked back since. So I have been swimming upstream on foreign policy among my fellow conservatives for many years, and have been engaging interventionist all along. Long ago I came to realize that for many conservatives, interventionism isn’t so much a concrete specific plan as it is a general sentiment. It is the belief that the U.S. needs to do something rather than nothing, that we need to project strength rather than “weakness” and that we are essential to maintaining the global order and without our leadership and activism on the world stage the world would spiral into chaos. So for many rank-and-file conservatives, foreign policy interventionism, which I don’t concede is actually conservative in any meaningful sense, is a general inclination or posture rather than a carefully worked out set of policies. I believe I have been able to exploit this over the years in my battles with interventionists. In all these years I have yet to get a good coherent answer. What I usually get is boilerplate arguments that don’t really address the specifics of the case at hand and more of the same invocations of broad sentiments about U.S. strength and leadership. Almost invariably, usually sooner rather than later, references to Neville Chamberlain, 1938, WWII, Hitler, etc. get dropped. It should go without saying that if your foreign policy related to modern circumstances in the Middle East, for example, essentially boils down to “but Neville Chamberlain” then your case is weak, and you need to work on your justification for a policy that sacrifices an enormous amount of American blood and treasure. 1. Abolish all foreign aid. 2. Withdraw from all entangling alliances such as the North Atlantic Treaty Organization (NATO). 3. Withdraw from all supranational sovereignty sacrificing organizations such as the United Nations (UN), World Trade Organization (WTO), World Bank, etc. 4. Disclaim all implicit U.S. security guarantees such as Taiwan and Israel. 5. Bring all our troops stationed abroad home. 6. 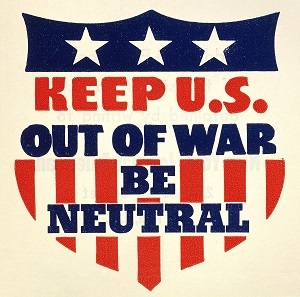 Generally pursue friendly relations with all countries and declare and practice neutrality in all foreign conflicts that we have no vital national interest in, especially the conflicts in the Middle East. 7. Downsize our military and move toward a reliance on state militias for the legitimate ends of protecting the country from attack and invasion. 8. Restrict immigration from high risk countries and regions. 9. And henceforth mind our own business on the international stage. I realize that this is a maximalist expression of non-interventionism that will sound jarring to many. This is because interventionism of one type or another is basically the taken for granted policy of the “official” right, the left and the center, so I am under no delusion that this degree of non-interventionism is going to become a reality anytime soon. But because interventionism to a greater or lesser degree is basically presumed in our current foreign policy debate, it is important to present an alternative vision in its unambiguous form. This is a start toward that end. This entry was posted in Conservatism, Foreign Policy and tagged Non-intervention. Bookmark the permalink. 4 Responses to So What’s Your Plan Then Mr. Non-Interventionist Smarty Pants?